Come into our Windermere office or our Keswick office to view our holiday cottages that are available to buy, advice given to anyone thinking of purchasing in the north or south lakes area. We look forward to meeting you! We can offer you many styles to suit your needs, such as Lodges, Cottages or Apartments many of which already have an excellent holiday letting record, and sold with future bookings. This entry was posted in Ambleside Lake District, Contact, cottage holiday group, Cottages, Cumbrian Properties, grasmere lake district, holidays, keswick Lake District, Lake District Cottages, News, self catering cottages and tagged Cottage, Cumbria, England, Grasmere, Holiday cottage, Keswick, Keswick Cumbria, lake district on April 27, 2013 by cottageholidaygroup. NATIONAL Trust workers at a former Lake District home of William Wordsworth were left open-mouthed when a surprise benefactor turned up with a cheque for £100,000. Allan Bank in Grasmere, which was later home to one of the trust’s founders, Canon Hardwicke Rawnsley, was opened to the public for the first time last year after it was devastated by fire in 2011. Staff had no idea that when they showed visitor Antony Elliot around the Georgian villa that he would present them with the donation on behalf of his cousin Brenda Donoghue. The former nurse left the bequest to the National Trust in the Lake District when she died last April, aged 83. After visiting the house, Mr Elliot declared she would have approved of restoration work there as she loved gardens and literature. He said: “My cousin loved books and beautiful colourful gardens and, though she had no children of her own, she delighted in seeing children play. Manager Dave Almond said: “This will allow us to continue some of the vital work needed to restore and conserve Allan Bank. “This is the first step in a very exciting project that will allow us to recreate the original views and restore the kitchen garden, as well as creating more spaces for books and reading. Visitor services supervisor Elaine Taylor said Mr Elliot, who visited the house with his wife and son, had already pledged to return to Allan Bank in the summer. She said a lot of the work done at the home, which has mostly bare walls and basic furniture, has been to keep a relaxed, interactive feel where visitors could enjoy a ‘home from home’. “Children and adults can play freely here, inside and out, they can create paintings of the views from the house, spot red squirrels in the grounds, take part in crafting, or just sit and read quietly. Wordsworth leased the property, which he previously said marred his views from Dove Cottage, for three years from 1808. The house is open seven days a week and staff said they were always on the lookout for volunteers to welcome visitors. via £100,000 bequest puts new life into William Wordsworth’s former home at Grasmere (From The Westmorland Gazette). This entry was posted in Awards, Contact, Cottages, grasmere, grasmere lake district, holidays, Lake District, Lake District Cottages, latest, News, update and tagged Dove Cottage, Elaine Taylor, Grasmere, Hardwicke Rawnsley, Home at Grasmere: The Journal of Dorothy Wordsworth and the Poems of William Wordsworth (Penguin Classics), lake district, Westmorland Gazette, William Wordsworth on April 3, 2013 by cottageholidaygroup. FIREFIGHTERS spent four hours rescuing a young bull from a slurry pit at a Lake District farm yesterday. Teams from Kendal and Ambleside were called to the Grasmere farm, at around 11am on Saturday, after receiving a report that a bull, weighing around one tonne, had ‘fallen through a hole in the floor’. A Cumbria Fire spokesman said: “It was a hard lift because of the dangers of slurry pits. “The hole was only about two metres by one metre wide, but we had to make it bigger to get the bull out. The roof of the barn had to be removed so crews could lift the bull vertically using strops and the farmer’s tractor. Attempts to winch the animal were unsuccessful. via Bull rescued from slurry pit in Lake District farm (From The Westmorland Gazette). This entry was posted in Ambleside, Contact, cottage holiday group, grasmere, grasmere lake district, holidays, Lake District, Lake District Cottages, latest, News, pet friendly, self catering, update and tagged Ambleside, Cumbria, England, Grasmere, Kendal, lake district, Slurry, Westmorland Gazette, Windermere on April 1, 2013 by cottageholidaygroup. Wordsworth may well have wandered lonely as a cloud. But if the Cumbrian poet had done his misty meanderings around the Lake District in the early 21st century rather than 200 years previously, it might have been a cloud of petrol fumes the daffodil-dabbler encountered. England’s biggest National Park – some 885 square miles of utter joy – has a problem. Too many cars. In short, it’s a victim of its own success. The creation of the National Park in 1951 has, of course, inspired millions of visitors over the years, drawn by the timeless beauty of the fells and lakes. And around 87% of the 16 million tourists a year arrive by car, choking the narrow roads and bringing the risk of pollution from exhaust fumes. So, in a £6.9million, four-year initiative, the GoLakes tourist board has started a scheme to get the visitors out of their cars, into a low-emission vehicle, or on to public transport and bikes. Not ordinary bikes, mind… but electric bikes that give the part-time pedal pusher some much-needed help up the hills. So, to join in the eco enterprise, I headed to the Lake District last autumn with the firm intention of steering clear of a car powered by the internal combustion engine. That journey from my home in Essex began with a walk to the station, an electric train into London, the Tube to Euston station, and an electric train out of London to the Lakes. And that Virgin Trains Pendolino service to Oxenholme is especially green too, as it is equipped with regenerative braking, which means that every time the driver applies the brakes, electricity is returned to the national grid. Consequently, Virgin Pendolino trains generate enough electricity each year to charge 4.5 million mobile phones. On arriving in Oxenholme, there would of course be no using a taxi to get to my accommodation in Windermere. A short train ride – diesel, but still public transport – saw me to the Cumbrian town’s station then a 20-minute walk brought me to the delightful Rum Doodle B&B. The bed part was a lovely four-poster and the breakfast part was good too. It was named and styled after a 1950s spoof mountaineering book, The Ascent of Rum Doodle, which I bought on Amazon and it is indeed very amusing. As was the witty, wry commentary from the crew on a boat trip around Lake Windermere from neighbouring Bowness-on-Windermere that afternoon. It was a glorious autumn day and the lake was mirror calm as we chugged past various sights including the unusual, circular house on Belle Isle. It was £7.20 very enjoyably spent. But the purpose of my trip was to test the GoLakes options, so the next morning I made an early start to catch a bus to Ambleside – where there was time for a quick wander around a very pleasant town – and then another bus on to Grasmere. Here, I headed to the Wordsworth Hotel and Spa, having reserved an electric bike. The Giant machine is a sturdy beast and comes with two battery packs so you would probably be good for at least 30 miles. There are three settings – economy, normal or sport – which offer 25%, 50% and 75% power assistance. So basically on the lowest, most frugal setting you do 75% of the work and the motor chips in with 25%. On the steeper roads of the Lake District – and there are plenty of those! – you really do need the highest setting. I had reserved an electric Renault Twizy car for £10 an hour at the Langdale Estate Hotel and Spa in Elterwater and the direct route there meant tackling the Red Bank road with its brutal 25% incline. Even with the battery going with the full 75% assistance it was eventually more than I could manage and I had to get off and push. Still, coasting on the other side of the hill to Elterwater soothed my thighs, as the bikes are heavy and even pushing one up a 25% slope is hard work. At the Langdale, I met Andy Dawson, the grounds manager who was getting my car ready, and Dan Visser, the marketing boss who is on the GoLakes committee and is one of the driving forces behind the electric car initiative. The Twizy is a small two-seater – one behind the other – and there’s no glass in the side windows, so you need a coat on a cool day. The range between charges is about 60 miles and, as with the electric bikes, GoLakes has created a network of charging points around the National Park. In an emergency you could simply stop at someone’s house and ask for a plug. Some people have been known to do that. So what’s the £6,690 Twizy like to drive? In short, fantastic fun. It is light, manoeuvrable, surprisingly nippy and virtually silent, which is very strange at first. But that silence means that as you are whizzing around the lakes and fells you hear the sound of sheep, birds and sometimes just the sound of silence. It’s wonderful. I pushed the Twizy hard, tackling a steep, hairpin pass with no problem at all. On the instrument panel there is an indicator which shows how much you are draining the battery and, conversely, when you are coasting downhill it displays the charge which is then being returned to it. After zipping around for an hour and a half I still had plenty of charge and if time had permitted I’d have whizzed about for another 90 minutes. But it would soon be getting dark and I did not want to tackle Red Bank at night – a wise decision as the damp hill was tricky to descend even in diminishing daylight as I gingerly inched down. Back at Grasmere, as I neared the Wordsworth Hotel to return the bike, I notched up a GoLakes electric bike first – a puncture. Luckily it was only 200 yards from the hotel, as wheeling the bike with a flat tyre was a real effort. Once the staff at the Wordsworth had worked out how to process the flat-tyre paperwork, I headed back to Ambleside on an open-top service bus, which really blew away the cobwebs. At Ambleside there was time for a couple of locally brewed beers before catching my bus back to Windermere, packing my kit ready for the morning train back home and having a pleasant pub meal at the Elleray. In the spirit of an ecofriendly trip to the Lake District I had a salad… plenty of greens, you see. 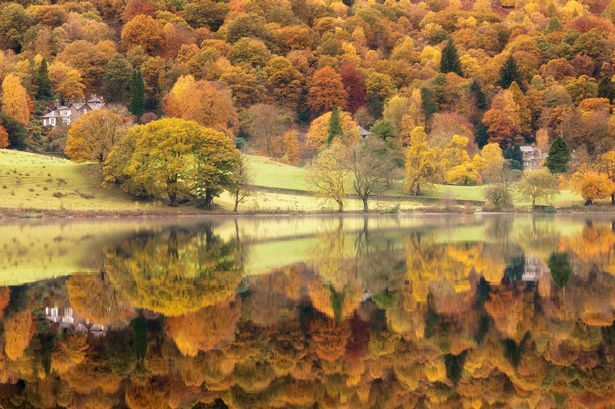 via Eco friendly breaks in the Lake District, go by train, electric car and bike in England’s biggest National Park – Mirror Online. This entry was posted in Ambleside, Ambleside Lake District, cottage holiday group, Cottages, grasmere, grasmere lake district, holidays, Lake District, Lake District Cottages, latest, News, self catering, self catering cottages, Windermere, Windermere Lake District and tagged Ambleside, Ascent of Rum Doodle, Bowness-on-Windermere, England, Grasmere, lake district, National park, Renault Twizy, Windermere on March 12, 2013 by cottageholidaygroup. CONGRATULATIONS Anna Richardson!! You have won a 2 night stay at our Lakeland Cottage in the heart of the beautiful lakes!!! Thank you for the support guys..
We will be running more competitions soon..! This entry was posted in Competition, Contact, Cottages, grasmere, grasmere lake district, holidays, Lake District, Lake District Cottages, latest, News, picture, pictures, self catering, self catering cottages, self catering holidays and tagged Accommodation, Anna Richardson, Cumbria, England, Lakeland Cottage, self catering, Travel and Tourism, ullswater on February 19, 2013 by cottageholidaygroup. Who wants a Valentine’s treat?! 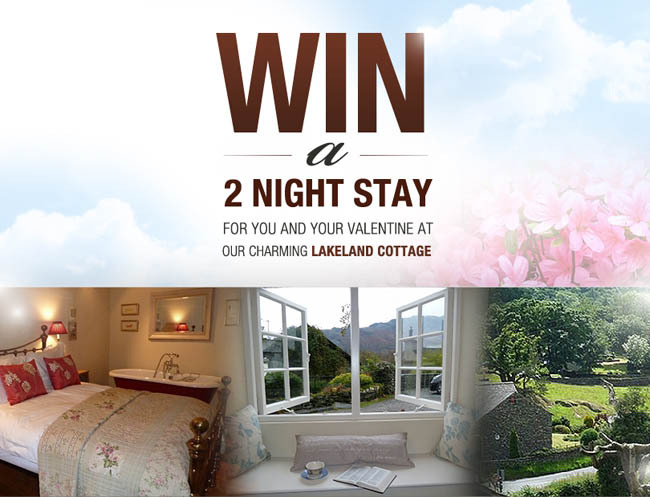 WIN A TWO NIGHT STAY at our beautiful Lakeland Cottage! All you have to do is Like, enter your email & share! Only a few days left till Valentine’s day!!! Do you want to make the most of it with your loved one? 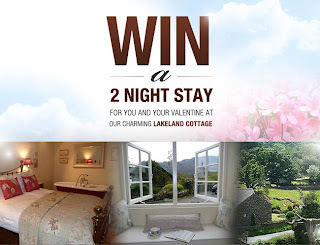 Keep entering and sharing our fantastic Valentines Giveaway for your chance to win a romantic stay in a traditional Lakeland cottage in the heart of the beautiful Lakes! This entry was posted in Competition, Contact, Cottages, grasmere, grasmere lake district, holidays, Lake District, Lake District Cottages, latest, News, picture, pictures, self catering, self catering cottages, self catering holidays and tagged Cooking, Entertaining, Holiday, Holiday Cookies, Home, Opinions, Valentine, Valentine Day on February 9, 2013 by cottageholidaygroup.